Due to regulation, it is established that every shareholder may have a maximum of one (1) share and vote. The total amount of shareholders of BVPASA is 43. 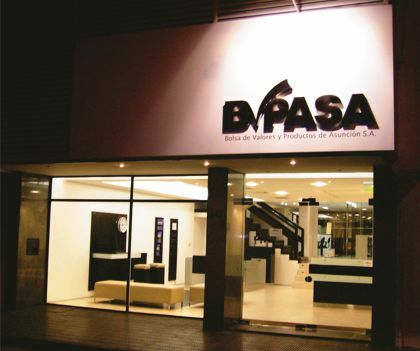 Bolsa de Valores y Productos de Asunción S.A. (BVPASA) was founded in 1977 upon the initiative of currently known as Cámara Nacional de Comercio y Servicios del Paraguay. The then prevailing political scenario hindered the development of this National Trade and Services Chamber. After the initial efforts to make it operative, trading sessions closed down before 1980. 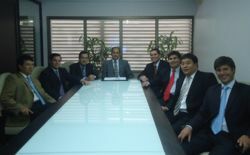 As from 1989, with political and economic changes occurring in Paraguay, the new Securities Market Law No. 94/91 was enacted in 1991, thereby reating the National Securities Commission. In 1993, trading sessions were re-opened, which marked the starting point of the Bolsa de Valores y Productos de Asunción’s trading history, and the production of statistical data on all stock-exchange transactions nationwide. The first statutory rules provided for tax incentives to promote company development and admission to listing, which had a major impact in the following years, with more than 50 corporations being listed as open companies/issuers. In only 3 years, trading volume increased by more than 600 percent on the BVPASA. In the last five years, significant projects have advanced on a promising note, such as the 2010 Electronic Trading System Implementation Initiative, which enabled the Securities Exchange to start providing Securities Custody services (a preliminary step to creating a future central securities depository), by way of dematerializing physical securities and registering securities holdings through book-entry records. Seventeen new issuers have been listed in the last 3 years. In addition to equities and corporate bonds, other instruments such as Subordinated Bonds issued by Banks, Investment Bonds issued by Credit Unions (Cooperativas), Commercial Paper, Negotiable Securities issued consistently with the development of Trusts, and repos with haircuts are traded on BVPASA. Additionally, as from 2012, the National Treasury has started placing Treasury Bonds through BVPASA. There are two clearing and settlement schemes depending on the market: Equity or Fixed income. In both cases, transactions shall be settled on T+2. Equity market: As trading is still based on physical securities, transactions are executed on the floor or traditional trading session, and Brokerage Firms are in charge of trade settlement. The latter must file within 48 hours documents and forms required by the Exchange, where they shall declare on oath that such transactions were finally cleared and settled. This case is applicable to cross-trading. In the case of ordinary trading, funds shall be deposited in a clearing account opened by the Exchange with a Bank, where all Brokerage Firms shall have opened accounts, and the Exchange shall perform final settlement. Fixed income market: In this case, instruments are handled through the electronic trading system, trading has been dematerialized and securities custody, which is book-entry, is provided by the Exchange. The procedure is as follows: Once transactions have been executed, Brokerage Houses deposit funds received from their investors in a clearing account opened by the Exchange with a licensed Bank, which acts as a Clearing Bank or Paying Agent, operating as instructed by the Exchange. Once deposits are confirmed as freely-available funds, the Exchange shall perform the relevant transfers to the selling issuer. All Brokerage Firms and issuers shall have opened accounts with the Clearing Bank. For principal and interest payments, on maturity date, issuers shall deposit in the morning such freely-available funds in the clearing account so that, in turn, the Exchange shall transfer them to Brokerage Firms, and the latter shall subsequently transfer them to their relevant investors. In the case of institutional investors, they generally deposit funds directly in the Exchange’s clearing account, without passing through Brokerage Houses, and then the Exchange transfers funds directly to them in payment of principal and interest. For transactions executed within the electronic trading system, the central counterparty (CCP) is the Exchange. As mentioned in the above section, the Exchange receives fund deposits in the clearing account opened with a licensed Bank within the specified terms, and it subsequently transfers them to the relevant participants. At the same time, the Exchange provides book-entry securities custody services.